As the holiday season wraps up, it’s time to work on those New Year’s resolutions. Since January is National Train Your Dog Month, why not use the opportunity to start some good habits and strengthen your bond with your pup? Training can seem daunting for people with no experience, and it may seem like a lot of effort when all you want to do is cuddle up with your dog. However, dogs are very intelligent and learn things far more easily than people give them credit for. Most dogs love learning, and breed with high intelligence depend on it to keep them stimulated. The training experience will only grow your relationship with your dogs. Whether you’re trying to curb unwanted behaviors, learn the basics, or go for the more advanced stuff, National Train Your Dog Month is the perfect time to start the year off right for you and your pooch. Clicker training is a technique widely used for teaching dogs. 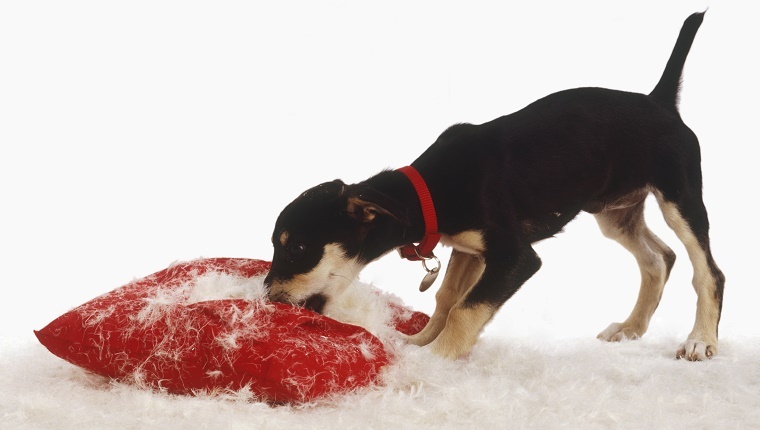 A clicker makes a clicking noise–obviously–that signals to a dog that they’re doing what you want them to do. It’s more immediate and precise than verbal rewards. There are plenty of cheap, effective clickers available on Amazon . 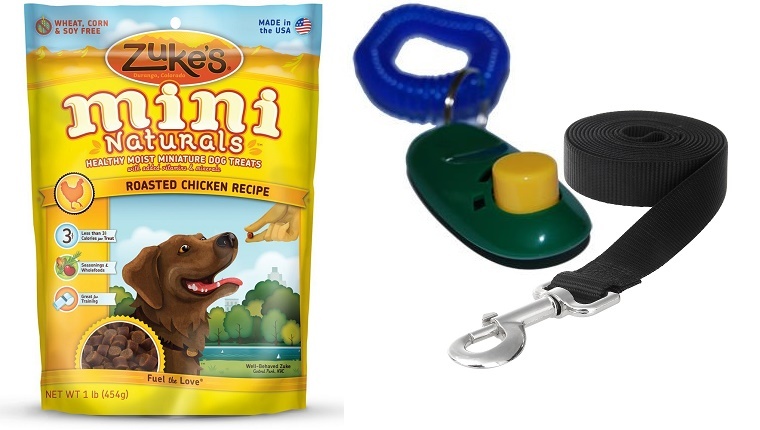 For clicker training, you’ll also need treats. You should follow every click with a reward, at least in the initial stages of training. This helps your dog learn to associate the clicks with a positive response. Zuke’s is one of our favorite brands of treats. Their Mini Naturals are small and soft, perfect for training purposes. With a pocket full of them, you’ll have your dog’s attention. Zuke’s Mini Naturals are also available on Amazon. For some training you may also need a leash, especially if you’re trying to improve your dog’s on-leash behavior. Make sure the leash is appropriate for your dog’s size. Retractable leashes don’t always make the best choice for training, so do your research. While you’re on Amazon for your other supplies, you can pick up a leash , as well. 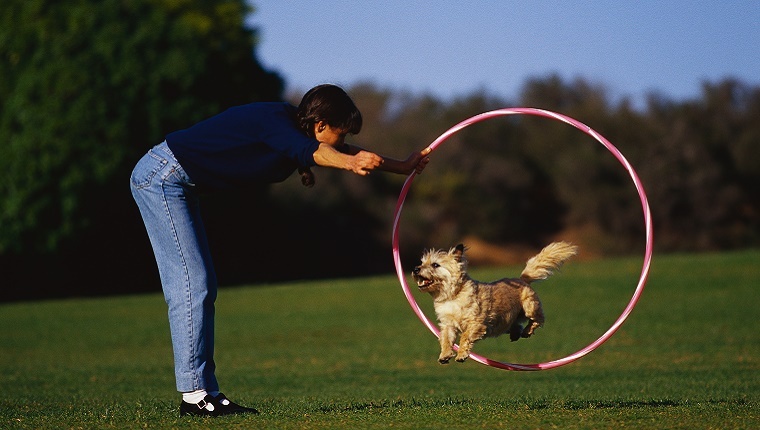 You may not be interested in all the hoop-jumping and dance routines that show dogs are capable of. Maybe you just want to master “sit” or “come” or “stay”. The key is plenty of rewards and patience. Your dog may not understand in ten minutes exactly what you want them to do. Keep at it on a daily basis. Training is gradual. If your dog is too excited to sit still or pay attention, try training after a long walk or some vigorous exercise after some of the energy is burned off. DogTime has plenty of information on how to get started with the basics, which you can find here. YouTube is also a great place to start if you need more visual aid. Basic commands are fine, but will they stop your dog from barking too much or chewing things they aren’t supposed to? Actually, they can. Stopping a dog from unwanted behaviors often starts with teaching a dog to do something, rather than what not to do. For instance, teaching a dog not to bark can start with teaching the command, “Speak.” If a dog knows when they should be barking, a dog can also learn the command to stop barking. Even chewing appropriate toys, rather than your clothes or pillows, can be taught in this way. Again it’s a matter of patience, and no method works instantly. But if you keep at it, your dog will appreciate it far more than being chastised or yelled at for doing something they don’t understand is wrong. Positive reinforcement is a strong teaching tool. If you have a very intelligent breed like a Border Collie, your dog may be learning too quickly and grow bored with the standard commands. This is where a high-energy personality comes in handy. Advanced tricks that require mental stimulation and physical activity might be the best way to keep your dog from using all his bored intelligence to cause trouble. And really, advanced training isn’t all that different from the basics. Use the clicker to steadily reward behavior, increasing the difficulty after each level of completion. Again, DogTime has information about advanced training that will get you started, and you should supplement that information with YouTube tutorials if you’re having trouble. Have you resolved to do any new training this year? 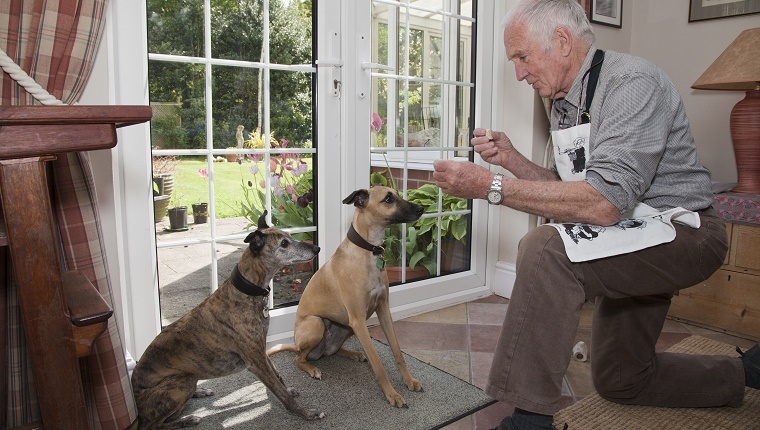 What kinds of things are you hoping to teach your dog during National Train Your Dog Month? Let us know in the comments below.